Runners in the Marine Corps Marathon race to arrive at the finish in Rosslyn. To celebrate the achievement of arriving in Rosslyn, the portion of Wilson Boulevard in Rosslyn between N. Lynn St. and N. Moore St. has been renamed "Marine Corps Marathon Drive." This year's Marine Corps Marathon is this Sunday, Oct. 27. Workers have already begun the marathon task of setting up the course. 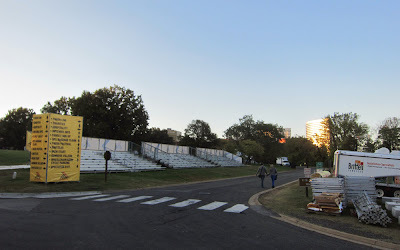 Expect streets to be filled this Sunday with runners thrilled to have arrived in Rosslyn. The best way to get around, as always, will be by foot or by bike.